Flappy Bird developer, Dong Nguyen, announced a few days ago that he was removing the addictive app from both the iOS App Store and Google Play. He reasons are his own, and we can respect that. What happened this morning when the iOS version of the game disappeared from the App Store is nothing short of unbelievable. 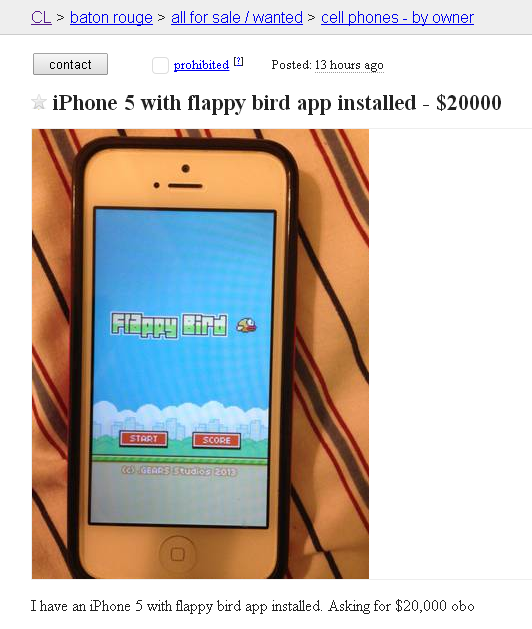 The vultures have come out of trees to pick at the carcasses of disheartened Flappy Bird fans by offering Apple iPhones on Craigslist and eBay for ridiculously inflated prices, some up to $20,000! I can understand it may be a bit difficult for the average iOS user to sideload, but anyone buying an iPhone or Android device for these extortionist prices is an idiot. The vultures are even offering the download and sideload instructions for $200. 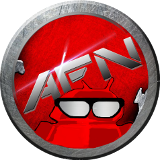 Okay, Android Fans, if you want to reinstall the game, just send AFN a check for $20,000 made out to CASH, and we’ll be glad to mail you the “Flappy Bird Super Rare Limited Edition” Android phone of your choice. Either that, or click here for the last known APK to sideload. This entry was posted in News, Rants & Opinions and tagged flappy bird. Bookmark the permalink.